Redwater Slough is a small cave far east of Bravil containing vampires (quest-related). It contains only one zone, Redwater Slough. 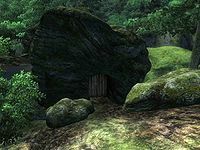 You can enter this cave and kill Hindaril even if you have not started the Vampire Cure quest; the Ashes of Hindaril then become a quest-specific item that you are unable to remove from your inventory. This cave contains 18 Cairn Bolete plants. 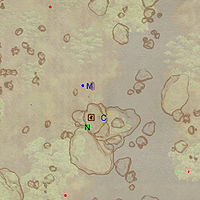 This location's map marker (M on map) is named Redwater Slough (editor name RedwaterSloughMapMarkerREF). The entrance door is SSE of the marker, 60 feet away. Your main target in Redwater Slough is Hindaril who resides in the northern part of the cave. However, the door at D must be unlocked to enter his domain. The key to this door, Redwater Slough Key, is located in the south section of the cave, in the chest at location k. When entering from door Out, you will face a large two-leveled room. The pit does not contain anything of interest, so make your way to the other side and pry open the two chests for some minor loot, then make a running jump onto the coffin clamped to the wall and claim the Shortsword of Numbing (C). Take the tunnel leading east, turn south at the intersection and deal with the undead opponents. Dive into the water and surface in the southeastern room. Take the key from the chest at k and explore the southernmost room for some more loot. 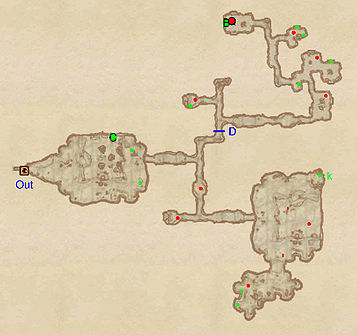 Backtrack all the way to door D and follow the tunnel, looting all the chests on your way (green dots on map). In the final room to the north you will encounter Hindaril (Q); when you kill him you will find Ashes of Hindaril instead of regular Vampire Dust on his corpse. 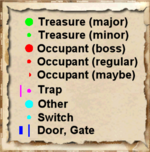 Finally, claim the contents of the boss-leveled coffin at B, then backtrack all the way to door Out, leading outside.